Around 1915 Dahlonega began being used for Hollywood Motion Pictures by Fox Film Company. They used an abandoned gold mine in their production "The Plunder" based off a novel by Roy North. Other silent movies that were shot in Dahlonega included "Big Jim Garrity" by Pathe Feres Company, "The Great Divide" filmed at Preacher Cut on Crown Mountain, "Driven" in the 1920s by Brabin Productions, and "The Daughter of Devil Dan" by Buffalo Pictures. Finally the city decided that if movies could be made in their area they should be shown. Silent movies were shown in a courtroom in the courthouse and in the Price Memorial Auditorium. In the mid 1920's Robert D. Howser Sr. converted the lower floor of the Price Building into a theater and began showing films. In 1939 Mr. Randall Holly Brannon leased the Price Building. He added a ticket booth, an awning, double doors, and large THEATRE sign. The opening film was showing April 17, 1939 titled "Stagecoach" staring Marion Morrison or later known as John Wayne. Since Brannon's wife ran their theater in Roswell and Brannon had to stay in Dahlonega to run this one he stayed at the Smith House in Room 1 for years. In January 9, 1943 Dahlonega Theater temporarily closed due to a fire destroying the adjoining building. The destroyed building had been an old hotel turned into a dorm for the North Georgia students. At the end of WWII Brannon decided Price was not an adequate space and applied to build a new theater. He was denied in September 1946. The Civilian Production Administration (CPA) was supposed to expire on March 31, 1947 so Brannon broke ground and began building his theater. Instead of the CPA being expired, its control was transferred to another governmental department. There were numerous construction and repairs needed in the county and this theater was using the much needed material, so on May 16, 1947 Brannon was ordered to halt construction immediately. After many letters written to congress written by citizens and other powerful officials explaining the situation that all the material for the Holly has been purchased and is sitting deteriorating. There were enough workers and this project was not interfering with any other projects. And so, in December 1947 Brannon's application was finally approved. 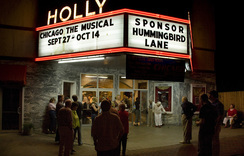 On July 12, 1948 the Holly Theater celebrated its grand opening! The featured film was MGM's "The Bride Goes Wild". It was as it is now. A sold brick building with a Georgia Marble facade. The interior was covered with fabric and the matching curtain was electrically operated. The theater held 500. A lady named Mrs. Ash ran the ticket booth. She just loved the movies and loved helping out. She became such a trusted employee that Brannon let her manage things and he was able to spend more time with his wife. The theater did well through the 1950s but into the 1960s people began to turn to television. Attendance dropped and when Mr. Brannon died in 1965 his wife tried to keep the theater alive. Money became tight and she raised admission to 75 cents due to lack of knowing what else to do. She cut off the water in 1970s for many reasons but her main one was for the freezing cold weather. People rented the building for various events but in 1976 J.L. Proctor reopened the theater but by November 1979 the theater was again closed. In 1980 the building was used to house worship by the Harvest Bible Church. Eventually, after all this, the building began to deteriorate. Weeds grew on it and it was in and out used but not taken care of. The building has now been restored and shows movies and plays. it isn't open all the time but there are weeks that the Holly show various types of entertainment. It is now a well known and loved place to college students, Dahlonega citizens and theater-goers in neighboring communities.